You are looking for a hotel room near Royan for a stay of a few days by the sea? The Océan Vacances village offers 20 comfortable rooms with individual access from the outside, located in the relaxing setting of a pine forest in Saint-Georges-de-Didonne. Single, double or family, our rooms are available at a low price. To allow you to organize your stay according to your budget and your expectations, we offer you the room rental per night, full board, half board, or without catering. 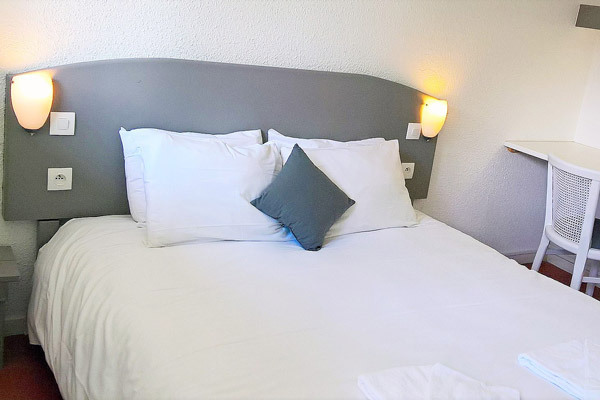 Enjoy a comfortable stay by the sea and low-cost hotel services at the village club Océan Vacances: we offer you low-cost rooms a few minutes from Royan. Simple and comfortable, our single, double and family rooms are equipped with a television, a bathroom and toilet. For a small price per night, you can enjoy all the facilities of the village club (swimming pool, sports fields and playgrounds) and its activities. You can freely choose between an economical formula of stay in half-board, for a 100% serenity with full board, or for a free stay without catering. In low season, we offer you exceptional rates on weekday stays, from 49 EUR per night for two people: the ideal way to enjoy a seaside getaway from April to the end of June and from the end of August. Don’t miss our promotional offers throughout the season: you can take advantage, for example, of special prices for last-minute bookings or discounts on long stays!